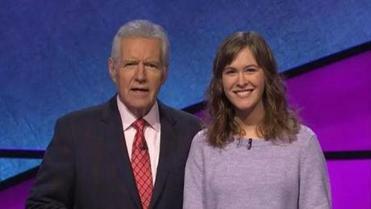 Globe journalist Carrie Blazina on Jeopardy. In October, I got what was, for me, the call of a lifetime. I was sitting at my desk at The Boston Globe when someone with a California phone number popped up out of the blue. The man on the other end was a producer from “Jeopardy!”, much to my surprise, and invited me to come on the show on Tuesday, Nov. 6. That phone call (which followed an online test and an in-person audition almost a year earlier) started a whirlwind four weeks of preparation, followed by a stressful but exhilarating day of taping. Now that the public has seen the show, I can finally talk about what the full experience was like. Spoilers ahead — beware! I flew out to Los Angeles a few days early with my boyfriend, Andrew; my parents and a few other relatives met us there. It was so great to have support from so many people — and thankfully the other contestants, once I met them, were really kind. Overall, the taping experience was an absolute delight. I was nervous, sure, but the producers do a wonderful job of making you feel comfortable, and you get a lot of opportunities to practice on the set before your taping. The show tapes five episodes a day, two days a week, and the pace is pretty fast. I watched from the audience with other waiting-to-be-picked contestants as three episodes flew by. After a break for lunch, I was picked for the fourth episode of the taping day, along with graduate student Andrew Kung. Carrie Blazina was on Thursday night’s show. I had watched earlier as several contestants came close to defeating reigning champion Jackie Fuchs. Jackie is a fearsome competitor, and I was, frankly, terrified to face a four-time winner. But I knew I just had to stick to playing the game one question at a time. So, the taping got underway. I actually felt great in the first round — I had a rhythm going and got several good answers in. I didn’t have the lead, but I felt like I was in a solid position. I should note that Jackie has since spoken publicly about how she fell ill during the taping. From my perspective, Jackie is pretty amazing for finishing the game, and I’m a big fan of hers. When we started the second round, I felt like my buzzer game wasn’t as strong as it was in the beginning, but overall I thought I had a good selection of categories. Thankfully, I didn’t get the “dreaded opera category” viewers and contestants often joke about. I was really excited about some of the clues — I even got to answer one about my favorite cartoon from childhood, “Spongebob Squarepants.” Most importantly, I only answered incorrectly once in the main part of the game (curse you, Bob Hope and Bing Crosby! ), and I managed to not embarrass myself, which was my biggest fear. In hindsight, I should have taken the correct answers I got and then picked higher-dollar-amount clues. Instead, I went for low amounts in categories I thought I would know. It’s not a bad strategy, but because there were two daily doubles left late in the second round, maybe I should have played differently at that point. Ultimately, my competitor, Andrew, made the game a runaway with his two consecutive daily doubles, which was too bad, but it also meant I didn’t have to stress too much about how much to bet in Final Jeopardy. Thankfully, I bet enough that even though I got the question wrong, I finished with $1, which put me in second place when Jackie bet everything and answered incorrectly. I’m not disappointed in the least with how things turned out. I really want to focus on the fact that I had some good moments against two strong opponents, and I’m proud of myself for turning in a strong performance. So, how am I going to spend the $2,000 I got for second place? Well, it’s not arriving for several months and it’ll be heavily taxed, but it’ll probably cover the cost of the trip to LA. I can assure you it was worth every penny, though. It was so surreal to watch myself on national television, and I’m really grateful to have met so many other lovely contestants and to have had so many people, near and far, reach out to me with love and support. I’ve been a lifelong fan of “Jeopardy!”, and I can’t wait to keep watching to see what happens next. Carrie Blazina can be reached at carrie.blazina@globe.com. Follow her on Twitter @carrieblazina.